The Mini Remote Scene Controllers are small handheld, wireless devices which generate "on" and "off" events. They are useful if you have a Virtual Wiring system with an INSTEON modem, and you wish to control things from a wireless handheld controller. The controllers have a set of buttons. Using Virtual Wiring, each button on a controller can be virtually wired to on/off Devices in the Virtual Wiring system. Mini Remote Scene Controllers are general purpose Devices for wirelessly controlling on/off type Devices in the Virtual Wiring system. When installing INSTEON devices in an INSTEON system, they must be linked (see linking devices). Mini Remotes, being INSTEON devices, are no different. 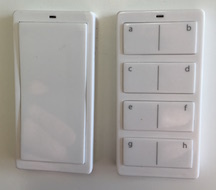 Due to the Mini Remote design, each button must be linked individually to the INSTEON modem. For a Mini Remote 8 with all eight buttons active, you must create a link from each button to the modem (a total of 8 links). Fortunately, only links from the Mini Remote to the modem are required (and not from the modem to the remote). The procedure for linking buttons on Mini Remotes is a bit different. Since there are multiple possible buttons, there are an equal number of possible controllers. To specify which button you are linking, press the button you wish to link before linking (if there are 2 buttons, one for "on" and one "off", press the "^" / "on" button). This tells the Mini Remote which button you are going to set up as a controller. After specifying the button, link per the usual method. The Mini Remote 8 Virtual Wiring Device has eight output status terminals - one for each of the 8 buttons on the physical Mini Remote device. Like the physical device buttons, the terminals are labeled a, b, c, d, e, f, g, and h. Each terminal toggles between an "on" or an "off" state each time its button is pressed. On the physical device, each button press generates either a green light, if the button is sending an "on" message, or a red light, if the button is sending an "off" message. The Mini Remote Switch Virtual Wiring Device has one status terminal, "1S". The terminal turns "on" when the switch is pressed upwards and "off" when it's pressed downwards. On the physical device, each press generates either a green light, if the device is sending an "on" message, or a red light, if the device is sending an "off" message.